My boyfriend recently got a new townhouse and in his beautiful new home is a beautiful new stove just begging for us to use it. I’ve been happily obliging, but when I discovered the oven is not only conventional but also a convection oven. I’ve never done convection baking or roasting, but after a quick Google search of how to adjust it, I decided to give it a try. My first experiment: convection roasting an espresso rubbed pork tenderloin. I’m always looking for healthy new ways to jazz up some of my favorite lean-protein staples (chicken breast, pork tenderloin, ground turkey, etc. ), and when I stumbled upon this coffee spice rub, I knew I’d found a winner. It’s quick, it’s easy, you barely have to let the meat (I used pork tenderloin) rest once it’s been rubbed and the flavor is fantastic. Best of all? You get a dose of caffeine with dinner (or lunch, as the case may be). Once the rub has been applied the meat can be grilled or roasted in the oven, and with a nice side salad or some grilled veggies, your meal is ready. This rub and recipe is low-fat, gluten-free and even paleo friendly. And the convection roasting? It turned out pretty darn good – juicy and flavorful in less time. Amazing! Preheat grill or oven to 425 degrees Fahrenheit. Combine coffee, sugar, oregano, paprika, cumin, mustard, coriander, salt and cayenne pepper in small bowl. Mix well. Sprinkle rub all over meat, and rub evenly over meat working spices in evenly. Let meat rest for 5 minutes while oven or grill preheats. For oven roasting: Place pork tenderloin in glass baking dish with aluminum foil for easy clean up later. For grilling: Wrap pork tenderloin in aluminum foil and seal ends to lock in juice with meat. 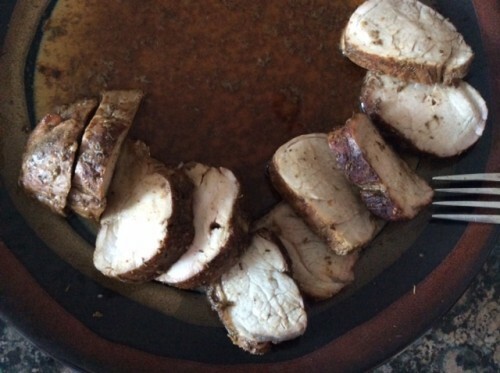 Grill or roast pork tenderloin for 20 – 35 minutes per pound or until meat reaches internal temperature of 145 degrees Fahrenheit. 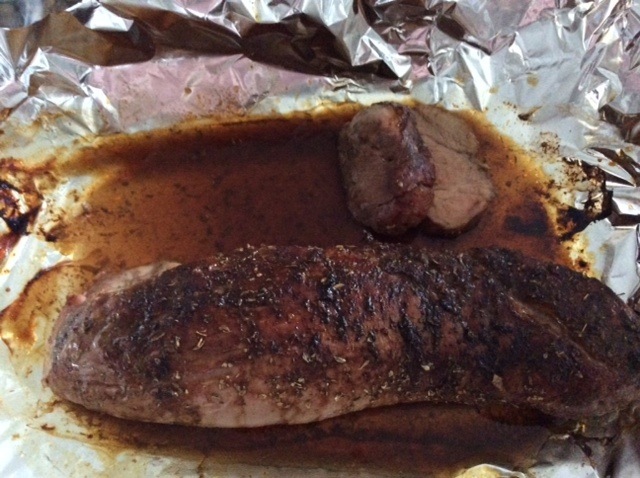 Remove from oven and let tenderloin rest for 3 minutes before slicing into it and serving. What are your go-to spices and marinades to make eating healthy easy? Have you ever tried convection roasting or baking? Any tips to share? A shot of the tenderloin fresh out of the oven. Look at that beautiful brown color and juice. The tenderloin cut into medallions and drizzled with more au jus. This entry was posted in Entrees, Paleo, Recipes and tagged Dinner, Entrees, Espresso, Gluten Free, Healthy, Low-fat, Paleo, Pork, Recipes, Tenderloin on May 16, 2014 by Paige N..